Here is a pocket cruiser for you: the Haber 620 built by Haber Yachts in Poland. I suppose you could go so far as to call this 20-footer a motorsailer given that you could sit at the mini dinette and have enough visibility to see forward and enjoy the scenery while the autopilot does the driving. For a crew of two this little packet offers some unique advantages. Overall, I quite like the look of this boat. The big house is nicely styled and while very tall, I like the proportions. It’s got that little ship look. From the profile it appears to me that the boat has a flat bottom. There is a small centerboard that reduces the draft from 4 feet 5 inches to 1 foot. It looks like the rudder blade kicks up. The L/B is 2.45. Using a DWL of 17 feet, the D/L would be 240, and that seems about right. There is not much ballast, only 616 pounds for a B/D of 23%. 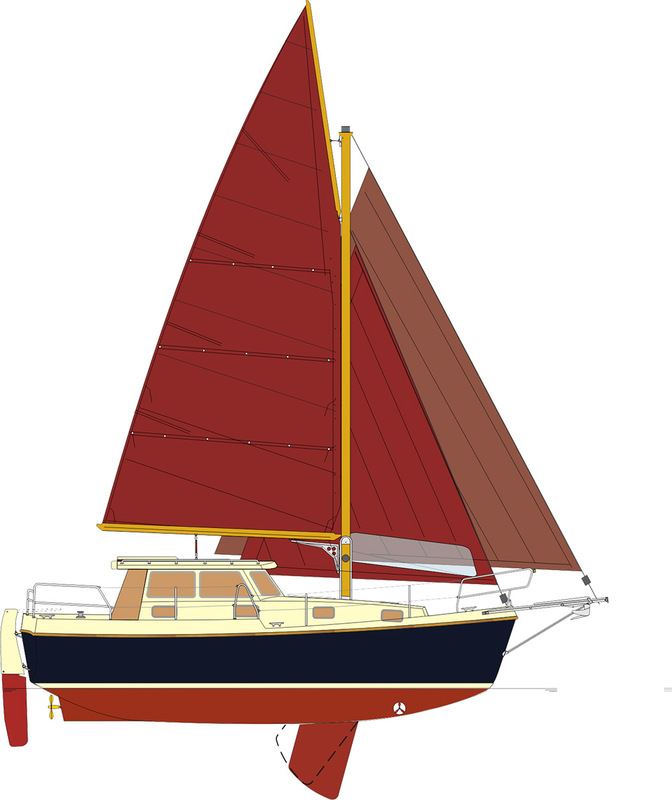 The accommodation plan is as simple as you would expect on a boat less than 21 feet LOA. There is an enclosed head aft and small but functional galley forward of the head. There is a dinette for two to port. The double V-berth looks quite large. This is an unusual rig. It’s a gaff rig with a single halyard for the main. Most gaff rigs have two halyards, one for the jaws end called the throat halyard and the other for the outboard end of the gaff called the peak halyard. Raising the main requires both halyards to work together to get the gaff. But this single halyard system simplifies that. I’ve done a single-halyard gaff before and it works fine. Shape control is maintained with a unique slider system on the mast, a flexible gaff and an adjustable loop on the main halyard. LOA 21’4”; Beam 8’2”; Draft 1’2” (board up) 4’1” (board down); Sail area 213 sq. ft.; Displ. 2,866 lbs. ; Ballast 661 lbs. ; Sail area 213 sq. ft.; L/B 2.45; D/L 240; Auxiliary 4-hp outboard.